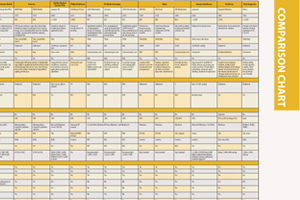 This article appeared as an introduction to the contrast media injectors comparison chart. Over the past few years, the trends in automated imaging contrast media injection systems have included the conversion from single- to dual-head injectors, the integration of data management systems and improved patient safety features. During the past decade, the industry standard switched from the single-head injectors first developed in the 1970s to dual-head injectors. The advantage of the dual-syringe systems is that one head of saline injects first to open the veins, followed by the second injector head of contrast. This is followed by a saline flush from the first head to keep the contrast flowing. As a result, much less contrast is needed (a reduction of about 30 percent), helping to reduce costs. Multi-head injectors also offer increased patient safety by reducing the flow rate pressures, which helps prevent damage to the veins. Users say contrast delivery is much more controlled and efficient when using a dual-head power injector. Also, these devices are required to accommodate the extremely quick imaging times that now are possible with new multi-detector computed tomography (CT) scanners. Data management systems are offered for several injector systems. These provide data to measure workflow efficiencies, imaging optimization and patient safety. The systems can integrate preprogrammed multi-detector CT protocols. An example of this is MedRad’s Connect.PACS informatics solution, which integrates each patient’s CT contrast-injection record with the associated clinical image set stored in the picture archiving and communications system (PACS). As studies are performed, it automatically documents and electronically archives contrast injection parameters into the secure database. The system enables Web-based information access throughout the hospital and from remote locations. It also can track and record all changes made to system and injection records. Acist Medical Systems offers its DICOM-connected IRiS (injector reporting information system) software package, which is designed to automate the data management process. IRiS helps administrators with analysis and decision-making by allowing the ability to track contrast use and reduce waste. The system also designed to communicate with a facility’s pharmacy to automate the ordering of contrast. Power injectors with standard, preloaded contrast media protocols are helping to make images more consistent, regardless of the technologist or radiologist using the system. Several years of research by major academic centers has been invested to create these protocols to help CT users with the advanced capabilities of their newer imaging systems. This is especially important for centers using various types of scanners (16-, 64-, 256-slice, etc. ), where different protocols are needed based on each scanner type and numerous exam factors, such as the contrast media parameters, rate of injection, volume, organ type being imaged and the patient’s weight. As an example, the Acist EmpowerCTA contrast injector has integrated, pre-programmed multi-slice CT protocols for IsoVue-370 (iopamidol injection). Other injector system features may include extravasation sensors to warn if the injector needle is embedded in tissue instead of inside the vessel, intuitive auto-initialize, auto-fill and auto-purge features, air embolism detection and protection, and on-the-fly flow rate manipulation. CT systems use a dual-head injector with two syringes for initial and follow-up contrast doses during imaging. Injectors used in cath lab angiography are single-head injectors using one syringe. Another major difference is where the contrast is injected. CT systems all use venous access. Air embolisms are not a major issue, because any small bubbles injected into a vein are expelled through the lungs. Angiography systems inject contrast into arteries, where air embolisms can present a serious risk. For that reason, many cath lab injectors have air embolism detectors, warning of bubbles in the line before they reach a patient. volume, fixed-rate injections delivered with relatively high pressures. However, in the interventional suite, procedures need low, variable flow rate injections. Contrast injector systems used with magnetic resonance imaging (MRI) systems are engineered to prevent electrical interference in the magnetic field. Devices may either use a hydraulic control system or include shielding of the electrical controller. Automated contrast injectors were first introduced in the cath lab as a way to conserve contrast media in an effort to save money. But in recent years, they are seen as a way to help limit contrast dose, particularly in patients with renal impairment. The iodine-based imaging agents used in angiography and CT can cause contrast-induced nephropathy (CIN). Automated contrast injection systems help physicians monitor the dosage used. Some systems also allow physicians to set the precise amount of contrast used during each injection. Manual devices, and some automated systems, do not allow for meticulous control of the flow rate, amount and peak pressure.